The short answer is “not very,” at least for right now. But we all remember the parable of the ant and the grasshopper. It’s a good idea to create your Google+ profile and business pages now to reap the rewards later. Google+ is another way to promote your social networks and blogging, but it still isn’t the most important network you’ll use to promote your business: Facebook and Twitter are still the first social networks that the average internet savvy consumer is looking to for information and updates about your company. Google is hoping we’ll all jump into Google+ headfirst, but it isn’t happening that way. New research shows that most users don’t notice any difference in Google search results since Google+ “Search Plus Your World” integration, especially among older and lower income populations. Depending on your client base, Google+ may be having no impact on your search results. (If someone hasn’t signed up for Google+, they aren’t getting specialized search results.) But, it would, of course, be foolish to ignore Google+. The smart move is to set up your Google+ profile and business pages making sure you’ve linked all of your other social networks, so you’re ahead of the curve if and when Google+ becomes a major social network for more than just Google employees and tech geeks. 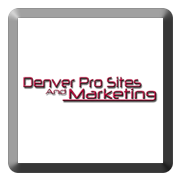 For help with your small business social networking visit our website and contact us today: www.denverprosites.com.